Aim: To interpretdata given relevant to my knowledge of physics and present the information I have found. The data is about falling with air resistance. 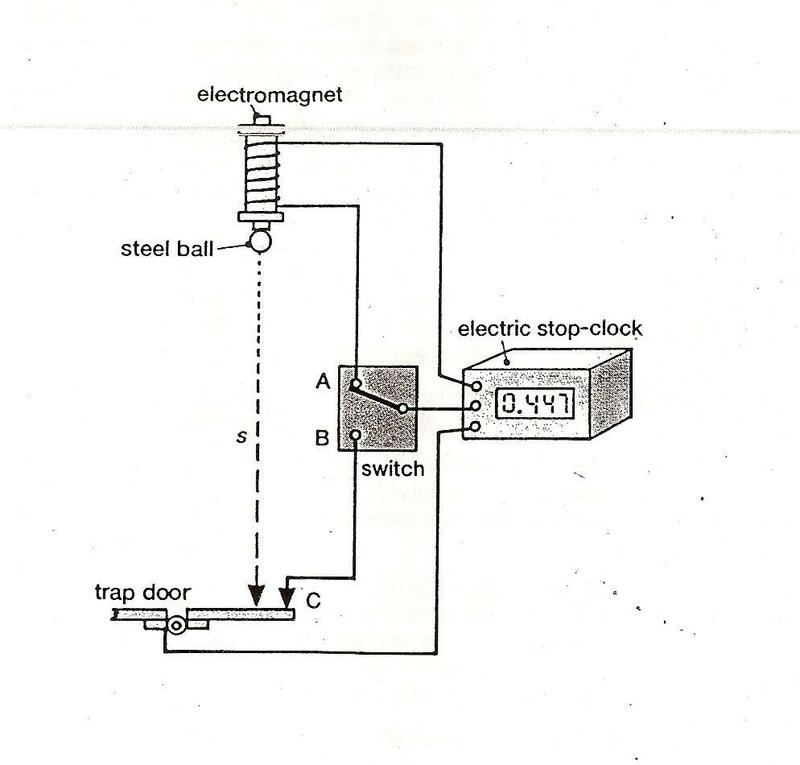 To release the ball you flick the switch from A to B, this turns off the electromagnet that is keeping the ball in place. 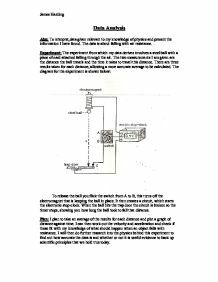 It then creates a circuit, which starts the electronic stop-clock. When the ball hits the trap door the circuit is broken so the timer stops, showing you how long the ball took to fall that distance. Plan: I plan to take an average of the results for each distance and plot a graph of distance against time. I can then work out the velocity and acceleration and check if these fit with my knowledge of what should happen when an object falls with resistance. I will then do further research into the physics behind this experiment to find out how accurate the data is and whether or not it is useful evidence to back up scientific principles that we hold true today. As the ball only falls 95cm at maximum, it is unlikely that it will have reached its terminal velocity, but I should be able to prove that the acceleration decreases due to air resistance, I expect that the acceleration will decrease proportionally compared to time. 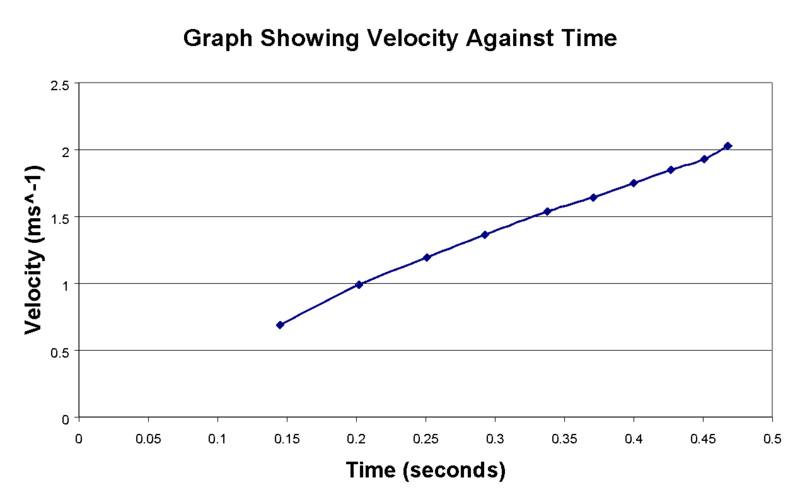 Investigation: I have drawn a graph of the average time against the distance and it shows a very gentle curve, this shows that the ball’s velocity is changing because the velocity is the gradient of the graph. The gradient increases as the time increases, this means the velocity is increasing as the time increases. An increase in velocity means acceleration. Therefore if the acceleration is constant then the distance must be proportional to the time squared. I will therefore draw a graph of the distance against the time squared to see if there is a linear relationship. 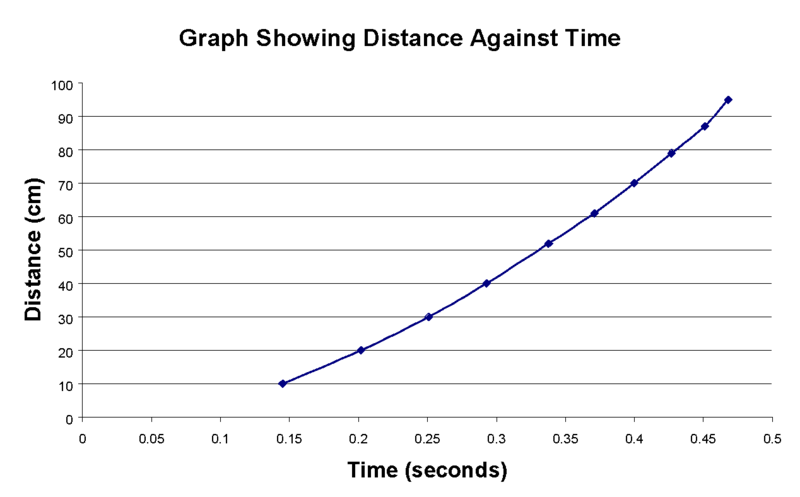 The velocity-time graph shows a gentle curve, this indicates that the acceleration is not constant. 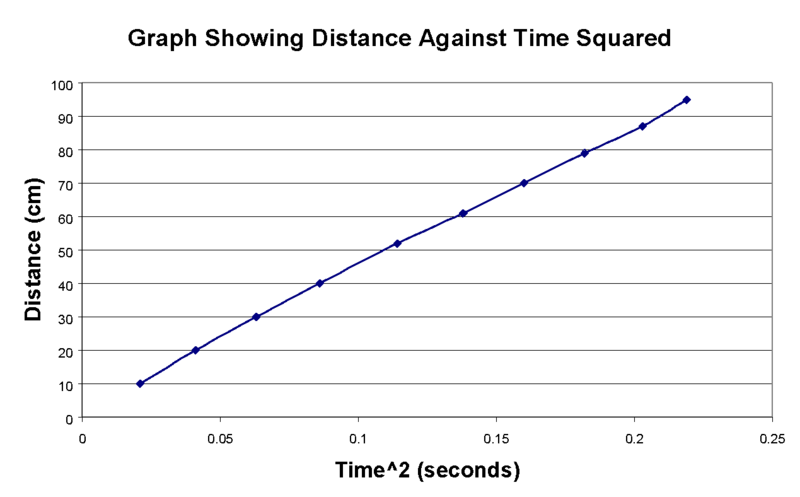 The acceleration the change in velocity over the time taken, this is the gradient of the graph. Since the gradient decreases as the time increases we can say that the acceleration decreases as the time increases, which proves there is air resistance. The final result shows a larger gradient in proportion to the rest of the graph, because of this I will treat it as an anomalous result and not include it when calculating the acceleration. From this graph I can extract the acceleration between each test to see exactly how it changes. The table shows that the acceleration is decreasing as the time increases, which shows the presence of air resistance in the experiment. However the second result appears to be anomalous as well because it does not fit with the pattern. This graph shows how the acceleration is gradually decreasing but I have circled the anomalous results. The line of best fit is a curve because when the gradient reaches 0 the object will be travelling at its terminal velocity and there will be no acceleration. Conclusion: This data shows that air resistance greatly affects an object in free fall on earth. The acceleration on earth is 9.81 m/s^2 when ignoring air resistance so the results clearly show its presence. The acceleration decreases gradually which proves my prediction that the force of air resistance increases as the object falls. 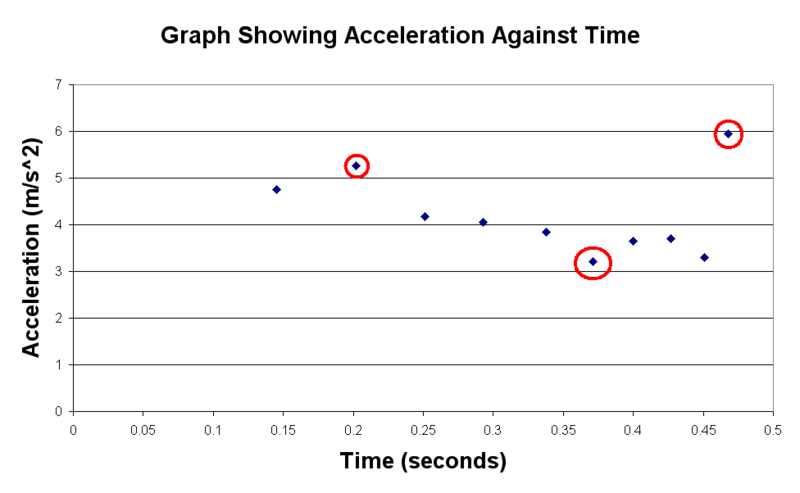 To improve the experiment results could be taken at larger distances until the acceleration-time graph shows a gradient of zero, this will show us the time taken for the specific object to reach its terminal velocity. The experiment also showed anomalous results, even though averages were used, so to improve the data anomalous results should be removed and the test repeated. An Investigation into the factors that effect the acceleration of a falling object. Investigating the amazingness of theBouncing Ball! Investigate the factors which affect the terminal velocity of a falling object. Terminal velocity of a falling ball. A micrometer will be used to accurately measure the diameter of a ball bearing and the readings will be recorded in a suitable results table. The ball bearing will then be held at the surface of the oil and released. Another way to improve the results would be to better standardise the place form which the trolley was released, as on the day this was only roughly estimated, leading to anomalies. Also, although this would be only theoretical, it would have been better to decrease the friction in the wheels, runway, and pulley and even air resistance. hard surface and clamp it so that it will remain stationary when you perform the bounce test. 5. Once the ball has been heated, hold it exactly 1 metre above the hard surface and then drop the ball. Ask you partner to measure where the ball bounced up to. 6. 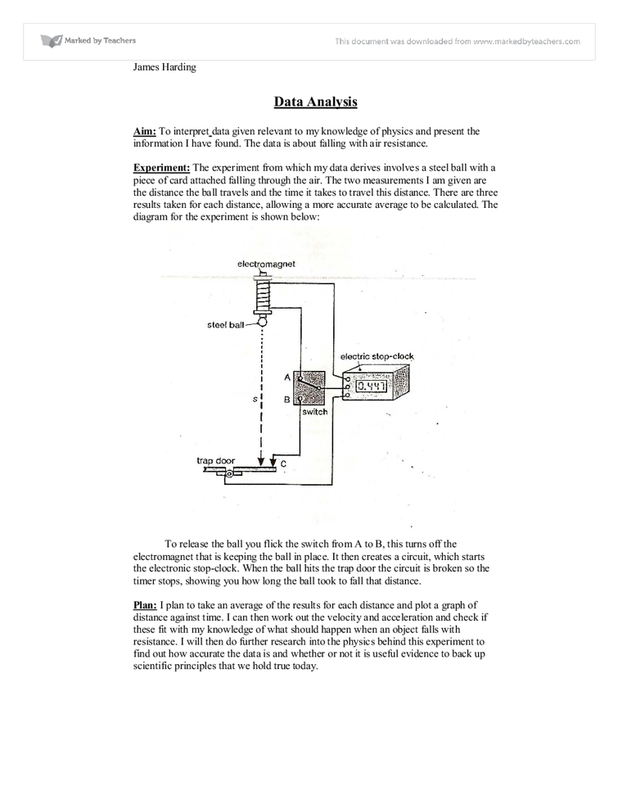 Once the data has been collected the terminal velocities for each ball bearing will be known and the viscosity of oil can also be measured using Stoke's law. Fair Testing (Accuracy and precision) To get an accurate set of results from this experiment it has to be fair. top of the ramp being converted into kinetic energy at the bottom. I've taken this theory from the source book 'Physics For You' (Keith Johnson) on page 115 where it simply explains the fact in a basic diagram of a diver climbing to the top of a board. The speed of the ball approaching the ground just after it was dropped; S = 1 U = 0 V2 = u2 + 2as V = ? v=-V(2x9.81x1) A = -9.81 =-4.43ms-1 Speed = 4.43 ms-1 The speed of seperation; S = 0.777 U = ? This may be because there was no air-resistance on the objects which meant surface area didn't have much effect on the falling rate. When adding another paper case each time, it is easy to notice that the mass alters the results each time by making the object fall slightly quicker.